Triad is defined by the Random House dictionary as: “a group of three closely related persons or things.” Founded in 1979 by Larry Pexton as a project to make a pre-Walkman portable cassette player, Triad soon metamorphosed into a speaker manufacturer. The company’s first product speaker system (hence the name Triad) called the System 70. Designed by Ed Long and Ron Wickersham, the System 70 was exceedingly com pact, featuring two minute satellite speakers and a small powered subwoofer. Triad manufactured the system 70 for almost ten years, finally discontinuing it in 1991. 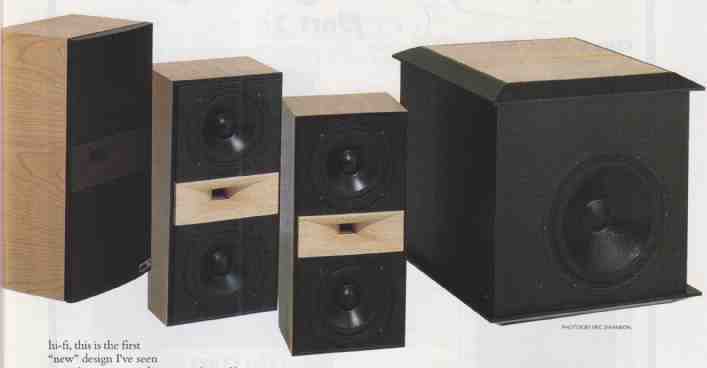 While Triad’s original designs were sold through traditional retail audio stores, in 1990 they decided to specialize in speakers for the home theater/ custom-installation market and abandoned their existing distribution system. Many of the speakers Triad now makes are for custom in-wall applications. Triad was the first manufacturer to produce a THX-certified in-wall speaker. Triad’s speaker production methods are unique. Rather than doing manufacturing “runs” of a particular product in advance, Triad makes every thing to order, using a process pioneered in America by Hewlett Packard called “flexible manufacturing.” While Triad makes 28 different speaker boxes, they’re all done on the same small production line. The goal is to avoid having large amounts of finished stock sitting around. Central to this manufacturing methodology is the “computer numerically controlled” (CNC) router device. With a CNC router, a manufacturer can quickly change from making one product to another. Triad has two of these techno logical wonders in their Portland, Oregon facility. Both are run by a proprietary computer program developed by an Intel programmer exclusively for Triad. Triad obviously believes that “the bottom line” is more than just a bunch of numbers. Quality is not just an abstract concept, but a goal for their products and lifestyle. It just goes to show you that good ideas never completely die, they just get continually recycled. The Gold LCR speakers have a 1-inch Vifa silk-fabric dome tweeter behind their dispersion control lens. The tweeter is flanked by a symmetrical array of Seas 6.5” poly propylene midrange drivers. The 3100 Hz crossover between the tweeter and the midrange/woofers is a fourth-order design, as is encouraged by THX. The drivers are housed in a sealed- enclosure cabinet constructed of premium quality MDF, finished in either black or wood veneer. Triad’s brochure notes “If you see something that looks like wood on a Triad speaker, it came from a tree.” Their veneers are manufactured in Japan, and are actually a sandwich of veneer, paper backing, a thin aluminum sheet, and a final layer of paper. The cabinet is extremely rigid with extensive internal bracing. One knuckle-rap on the outside of a Gold LCR is enough to convince you that these speakers arc solid. The speakers can be attached to dedicated stands or wall- mounts, using 3/8-inch threaded mounting holes on their backs and bottoms. Fit and finish on the review samples were very good. The cherry veneer was an attractive complement to the solid maple dispersion control lenses. The OnWall Silver surround speakers use a pair of 1-inch Morel tweeters and 5.5” Seas midrange drivers in a dipole configuration. They also have a 4th-order crossover, but here the crossover point is 2600 Hz. As their name implies, these speakers are designed to mount on the wall. Their flat backs incorporate a vertical route for running a speaker wire, as well as four mounting holes. As with the InRoom Gold LCR, termination hard ware consists of two high-quality knurled-knob 5-way binding posts. Like the Gold LCR speakers, the Silver surrounds have metal mesh grille-covers. ‘While these covers arc attractive, and pretty much standard issue for custom installations, they are not even vaguely in the running as the most sonically transparent grilles on earth. All critical listening was done with the grilles removed. The InRoom Gold subwoofer is not THX certified. ‘While Triad makes two THX-certified passive subwoofers, they believe the InRoom Gold is their best performing model, so that’s what they sent for review. It features two Vifa 10-inch cast-basket drivers with 2-inch voice coils and coated-paper cone material. The drivers are arranged in a rather unconventional parallel-push configuration called a “horizontal opposed asymmetrical mounting.” One driver is located on one side of the cabinet while the other is baffled onto the opposite side. They both point in the same direction, and are mounted on the same axis. They are in phase acoustically, but out of phase electronically. They also fire to the sides of the subwoofer rather than to the front, back, or floor. This methodology produces a woofer that cancels out most of it’s own cabinet resonances through opposing woofer movement. Placing a glass of water on the top of the cabinet while the bass was cranking proved the effectiveness of this scheme; the water barely rippled. The subwoofer’s internal amplifier is a hefty 250W unit with four line- level inputs. The amplifier has a toroidal transformer, 1 tolerance resistors, and Roderstein polypropylene capacitors. The lowpass crossover filter is a second-order design that is variable from 50 Hz to 180 Hz. The subwoofer has two level controls, a variable phase control that ranges from 0 to 180 degrees, in addition to a variable low- pass filter control. There is no on/off switch, but after 7 minutes of inactivity, the woofer goes into “standby mode.” It wakes up whenever it senses an input signal. The top of the subwoofer sent for review had a removable gray-speck led granite insert. Alternative custom- made wood inserts are also available. The Triad system went into the small room where I review all surround- sound systems that come my way. The room is approximately 17 feet long by 12 1/2 feet wide with an 8-foot ceiling that vaults up into a 15-foot-high pyramidal skylight in the center. The left and right front speakers ended up 39 inches from the back wall and 55 inches and 54 inches from the sidewalls. The front speaker tweeters were at exactly ear height and just over 7 feet from listening position as the tape mea sure flies. The center speaker was placed on top of my video monitor, slanted forward approximately 10 degrees. Its tweeter was located 17 inches higher than the front-speaker tweeters. The subwoofer’s front baffle was 2 feet from the back wall while its rear was 5 inches from the back wall. It was 4 feet from the nearest side wall. The surround speakers were located parallel with my ears, 38 inches from the rear wall and just under 7 feet off the floor and 5 feet away from my ears. Other components in the review system include a Parasound HCA 1206 THX-certified amplifier driving the front three channels and two rear channels. The brains of the system was a Fosgate Model 3A at the beginning of the review, and a Harman Kardon Citation 7.0 later on. Video gear consists of a Proton VT-331 31-inch monitor, Sony MDP-750 laserdisc player, Fisher FVH-8901 VHS HiFi VCR, and Sony SLH-900 Beta VCR. The digital front end employs an EAD DSP-7000 III digital-to-analog converter (DAC) with a TEC TL-2 CD transport. An Audio Alchemy datastream transmitter carries the Sony LDP’s digital output to the EAD DAC. The analog front end consists of a VPI HW-19 series IV turntable with Clearaudio/Souther TQ-1 arm and Denon/ van den Hul 103C cartridge mounted on a Bright Star J-7 base sitting on a RoomTunes Justarack hooked up to either a Gold Aero dB-45 or a Michael Yee PFE-1 phono preamp. THX-certified inter connect and speaker cable used during the review was from XLO and Monster cable. Room-treatment devices included Tube Traps and Shadowcasters from ASC, and CornerTunes, SideTunes, and custom-made ceiling clouds from Michael Green Designs. Other accessories included Sound Design model SS-7 speaker stands, an Arcici Super structure II equipment stand, a Sound- style equipment stand, Bright Star Big Rock isolation bases under most components, and copious amounts of Buffalo Gold Winter Lager. The Triad system is the third and the most expensive THX speaker system I’ve reviewed for SGHT. Does its performance warrant its high cost? Yes, but only if you mate the system to components that allow it to perform at its best. With anything less than superb electronics, the Triads will mercilessly expose the weakest sonic link. These are the first THX-certified speakers I’ve reviewed that are as high-resolution as comparably priced “audiophile” speakers. It’s about time. The subwoofer, while not THX-certified, is quite capable of producing THX-standard volume levels with ease. Not only is the volume more than adequate, but articulation, detail, pitch, and impact are also excel lent. Everything from the rocket engines during blast-off on Apollo 13 to Rob Wasserman’s acoustic bass on Trios is handled nicely by the InRoom Gold powered sub. Setup was easy, but did require a slightly unorthodox arrangement. Rather than having the “front” of the sub-woofer facing forward, I turned the subwoofer 90 degrees so that it fired forward rather than to the sides as originally intended by Triad. If set up as specified, the woofer’s front driver would have been firing directly into the 1½-inch-thick butcher-block slab leg of my TV stand, which sits only 7 inches away. That struck me as a less- than-perfect setup, so I changed it. My only complaint with the InRoom Gold sub is that it hums. Without any input hooked up, even with the input shorted out, the unit produced a 120-cycle hum that was distracting in my otherwise quiet room. I tried all sorts of grounding arrangements, even petitioning the Lord with prayer, but I was never able to reduce the base-level hum to inaudibility. The hum was not objectionable when music or sound tracks were playing, but it was always present. In most rooms with the usual amount of background noise, this will probably not be a problem. But if you’ve spent as much time and effort as I have to ensure your room is as quiet as possible, the noise will bug you. The InRoom Gold LCR speaker blended very smoothly with the InRoom Gold subwoofer. After some experimentation, I settled on a low- pass-crossover point of about 70 Hz on the subwoofer and ran the LCR speakers full-range without any bass rolloff. Even on material with a lot of upper and midbass energy, the system never became dynamically constricted or compressed. The Twin 6 midrange/woofers in the LCRs handled the leading edges of bass transients nicely. Even percussively dynamic material like Joan Osborne’s song “Spider Web” was no problem for the Triads. The percussion instruments were punchy, well-defined, and never muddy or distorted. Moving on up the harmonic spectrum to the lower midrange and upper bass, the Triads are just a trifle warm, not so much as to sound thick, heavy, or pudding like, but enough to sound “friendly.” By friendly I mean slightly warm and inviting, like a warm fire on a chilly evening. While male vocalists don’t sound chesty or hooty, they do have a bit of extra richness that most people will probably find appealing. The midrange and lower treble are very accurately rendered by the Triad system. Not only is the harmonic balance good, but the resolution is exemplary. Halfway through the reviewing period, I switched from my long standing reference Fosgate Model 3A preamp/processor to a Harman Kardon Citation 7.0 A/V preamp. The difference between the two preamps was immediately obvious through the Triads. A pervasive grainy texture vanished, and inner detail and overall resolution jumped up several notches with the Citation. Out of curiosity, I substituted a pair of Pass Aleph 0 power amplifiers for the Parasound HCA-1206 amp on the left and right front channels (unfortunately, I only have two Pass Alephs Os). Wow! Not only did resolution once again take a giant stride forward, but grain was reduced while dimensional resolution and top-end delicacy increased severalfold. The Triads will force you to examine every link in your audio chain. You may not like the out come, as remedies can be expensive. While the Triads never sounded bad, still the differences that top-flight electronics will make in their performance is startling. 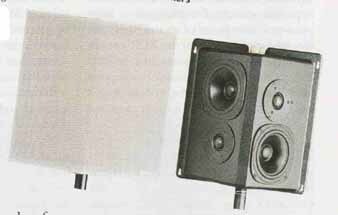 Another surprising aspect of the Triad system performance was how well the center speaker integrated with left and right front speakers. Most of the time I turn off the center speaker while I’m listening to music through a surround speaker system. But with the Triads I found that the “center speaker on” setting on the Citation 7.0 processor yielded a more seamless presentation of the front soundstage than with any other surround-sound system I’ve reviewed. Some of this improved integration was the result of using the Citation 7.0 processor, but even with the Fosgate 3A I found that more material sounded fine with center speaker active than ever before. The InRoom Gold’s upper-frequency performance was good, but not quite the equal of my small-room reference speakers, the Avalon Eclipses. The Triads lacked a bit of top-end air and upper-frequency delicacy compared with the Avalons. Cymbals, high-hats, and chimes were not as smooth and refined through the Triads. 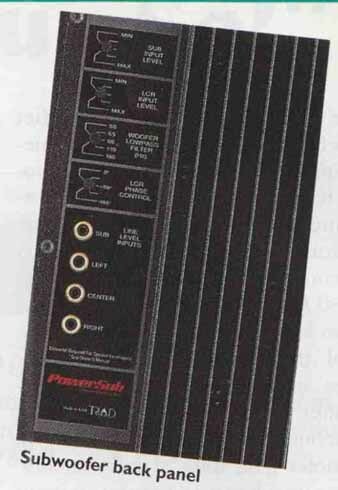 Using the Parasound amplifier, the upper-frequency sound often became hard and slightly metallic during dynamic peaks. Substituting the Pass Aleph 0 amps made this phenomenon vanish. The moral: use best amp you can afford with the Triads. On the plus side, at least the Triads weren’t beamy or excessively forward sounding. Also there were no noticeable “hot spots” or “bright zones” from the central listening position. Another plus for the Triads was their lack of closed-in or rolled-off upper frequency information. Even massed orchestral strings had some air and natural sheen. Spatial rendition and imaging are the strong suits of the Triad InRoom Gold. With top-flight electronics and source material, the InRoom Gold speakers were able to produce a large, three-dimensional soundstage that was almost identical to that produced by the Avalon Eclipses. Only the last bit of space at the very back of the hall was slightly compressed by the Triads. When coupled with the OnWall Silver surround speakers, the Triad LCRs could produce a very convincing rendition of three-dimensional space, especially on well-recorded classical music like the James Judd- directed Florida Philharmonic recording of Mahler’s 1st Symphony (Harmonia Mundi). The OnWall Silver surround speakers performed well enough that most of the time I was unaware of their presence—the true sign of a well-integrated surround system. Occasionally, I turned up the surrounds a dB or two over normal settings for soundtracks, but for music I rarely adjusted levels. Even on the most demanding material, like the loud parts of Apollo 13, they sounded smooth and unstressed. Worth noting is that according to their specifications, the OnWall Silvers are not “full-range” speakers, but correspond to the THX standard with a top-end rolloff of 3 dB per octave above 8 kHz. Unfortunately, you may find it difficult to walk into your local hi-fi emporium to hear a Triad surround system, since the company’s products arc only carried by folks who specialize in custom home installations. If you are contemplating a custom-installed home- theater system, your local high-end A/V installer might be able to demonstrate a Triad system they’ve put into someone else’s home. A call to Triad can put you in touch with custom installers in your area that use Triad products. You may even make a few new friends in the process. My overall impression of the Triad system is that it is a giant step forward in performance for a THX-certified speaker package. This is somewhat of a double-edged sword. Unlike many surround speaker systems, where good electronics are adequate to ensure optimum performance, with the Triad system only top-flight electronics will really permit the speakers to perform at their full potential. Don't even think of hooking up the Triad InRoom Golds to an A/V receiver; they need and deserve much better. Coupled with high-quality electronics, this sys tern can achieve the almost impossible-a THX-certified surround-sound system that sounds as good with music as it does with movies. I repeat: It's about time. The heavy little Triad s B weighted sensitivity was almost exactly to specification at a calculated 89 dB/W/m. It will go reasonably loud with few amplifier watts. Though its impedance dips briefly to just above 4 ohms in the lower midrange, it is basically an easy load for the partnering amplifier or receiver. As is usual with THX designs the Triad s bass is curtailed to optimize performance with a subwoofer. The on-axis response is basically flat, with just a slight amount of extra energy in the low treble. This is impressive performance for a unit using a horn-loaded tweeter, though the balance as SS noted does tend to be revealing of poor quality amplification There is also a small peak in a narrow band around 10 kHz which might correlate with SS s finding that the speaker could occasionally sound metallic. The dispersion is wide and even in the horizontal plane something that usually correlates with good imaging performance. Vertically the tweeter also offers good dispersion though the speaker loses a significant amount of low treble energy if you sit much above or below the tweeter axis. (This is typical of THX speakers.) In the time domain, the Triad was very close to being time coherent the tweeter output leading that of the woofers by a small fraction of a millisecond and in the same positive acoustic polarity. The waterfall plot was superbly clean from resonant colorations: this is obviously a very well-engineered design. Finally, the use of well-organized bracing pushes the panel resonances of the rigid cabinet high enough in frequency that they should not add significant coloration to the midrange. Even the most prominent resonance I could find on the side panel at 440 Hz, was way down in level. A nice one, Triad.